The wedding season is here! If you're looking for a great DIY lighting option, we've got just the thing. 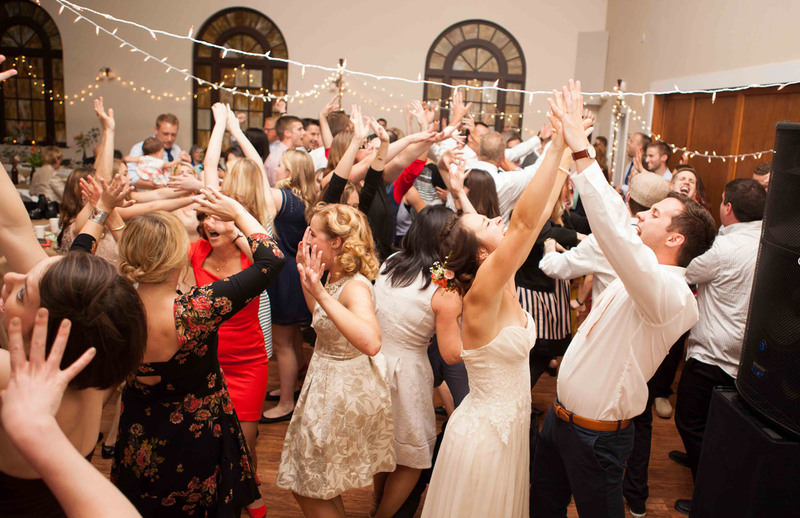 This is a fun project we made for my sister's wedding. The lights created a lovely ambiance that everyone enjoyed as we danced the night away. You can use whatever sort of lights you'd like. There are lovely globe lights, colorful bulbs, and many other types. We went with tiny white lights. Buy lights where the bulbs extend all the way to the end of the the strand. Our dance floor dimensions were 12’ x 22’. This rectangle shape took five strands of 50 ft. lights. Figure out what dimensions your lights will cover and buy accordingly. 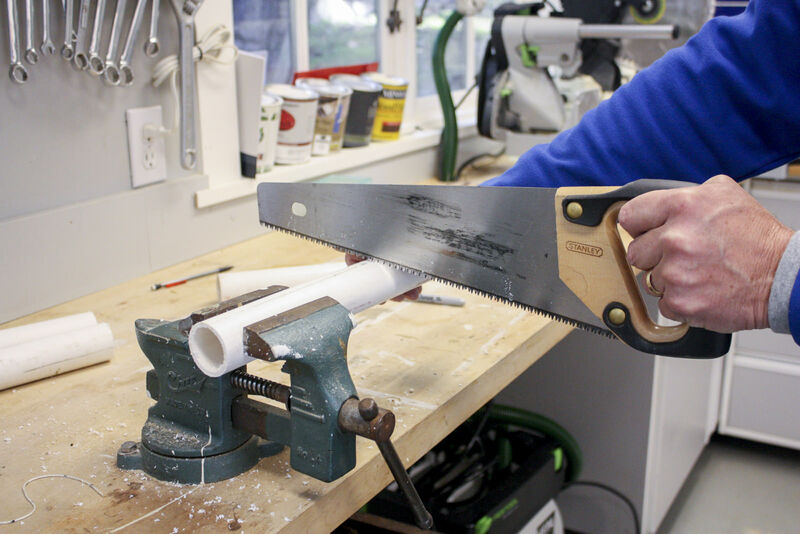 You'll be using the PVC as a sleeve in the concrete for the hemlock rounds to sit in. 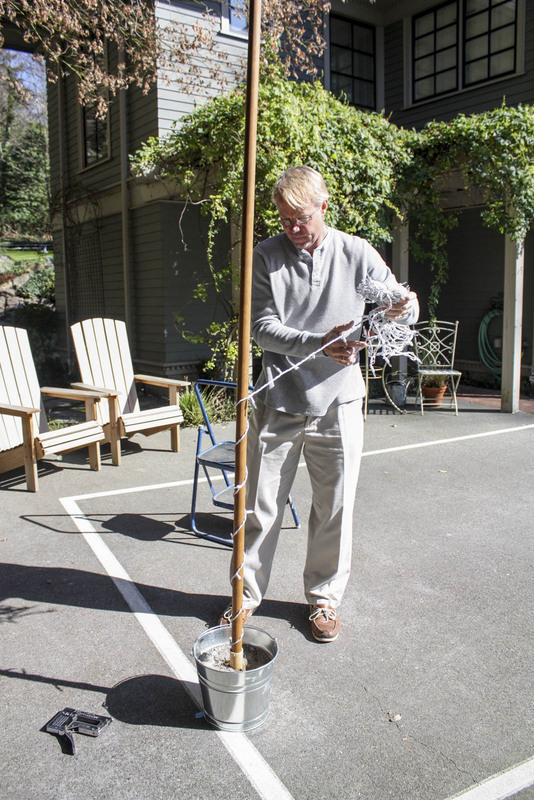 Measure the height of your bucket and cut the PVC pipe to the same length. For example, our buckets were 12" tall, so we cut four 12" pieces of PVC pipe (one for each bucket). We found suspending the hemlock rounds helped them stand straight and helped set the PVC in the center of each bucket. We were working in our garage and were able to hang them from screws driven into the ceiling. This isn’t essential, but it is helpful. You could also hang the rounds from a trellis, or possibly from a tree branch. Find the center of each round, then drill a screw in place. Knot a string underneath the head of the screw and use this to hang the round. Hang an inch or two from the ground. Next, it’s time to attach the PVC pipe to the hemlock rounds and bucket. 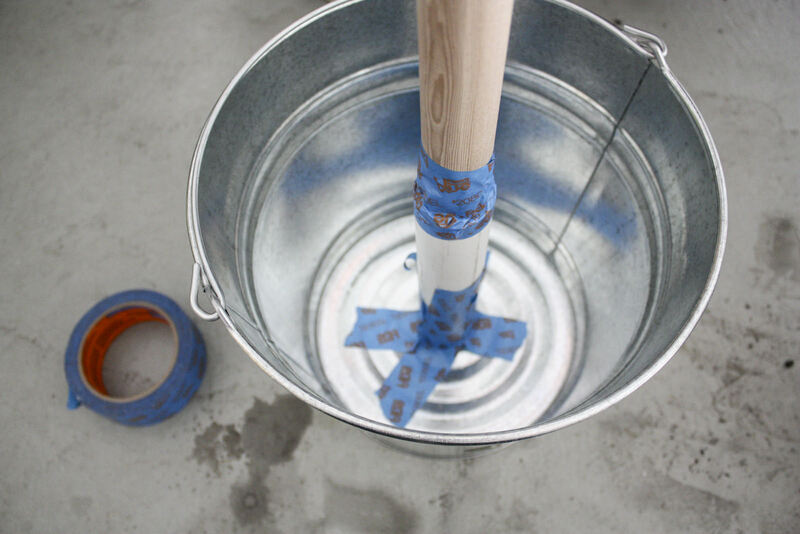 Slide the PVC pipe onto the end of the hemlock round, then position the bucket underneath and secure in place with tape. Tape off the wood where it meets the pipe to protect it from concrete. 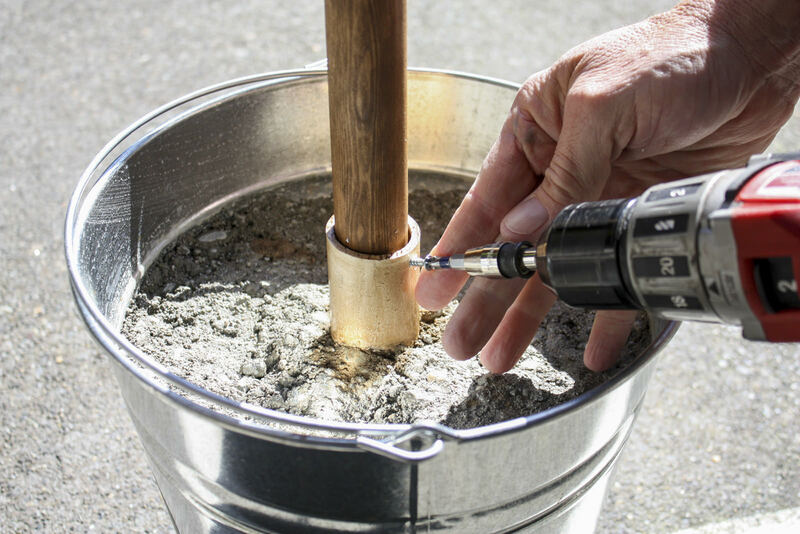 This both keeps the dowel free of concrete, and prevents the wet concrete mixture from seeping down the PVC pipe. 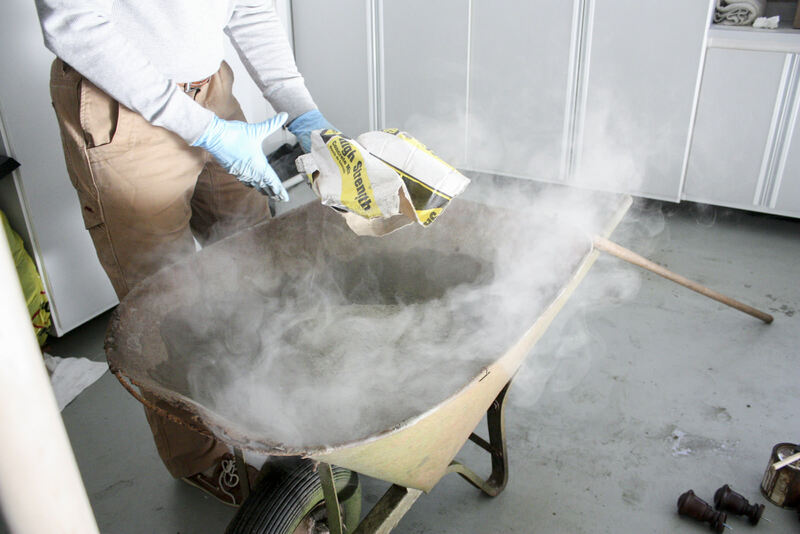 In a large bucket or a wheelbarrow, mix concrete with water. Follow the directions on your concrete (make sure you check the drying time while you’re at it.) The consistency should be similar to cookie dough. 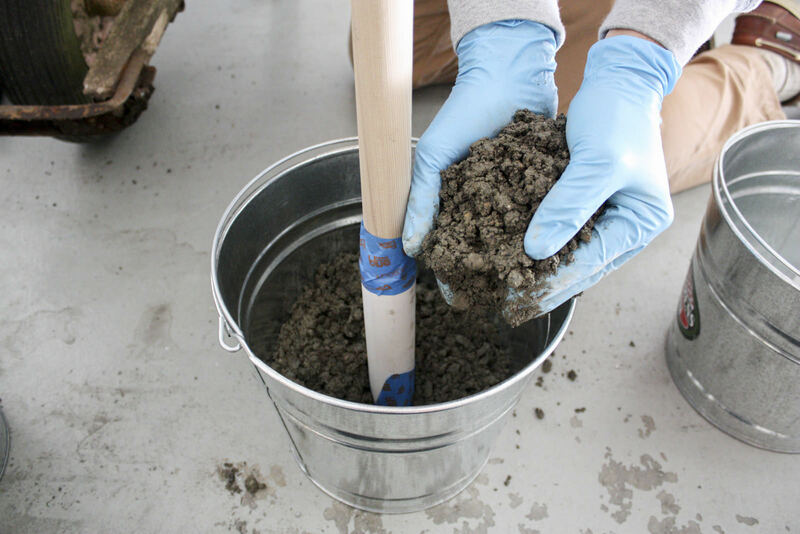 Note: the best way we've found for mixing concrete is by adding half the water and stirring thoroughly before adding the rest of the water. 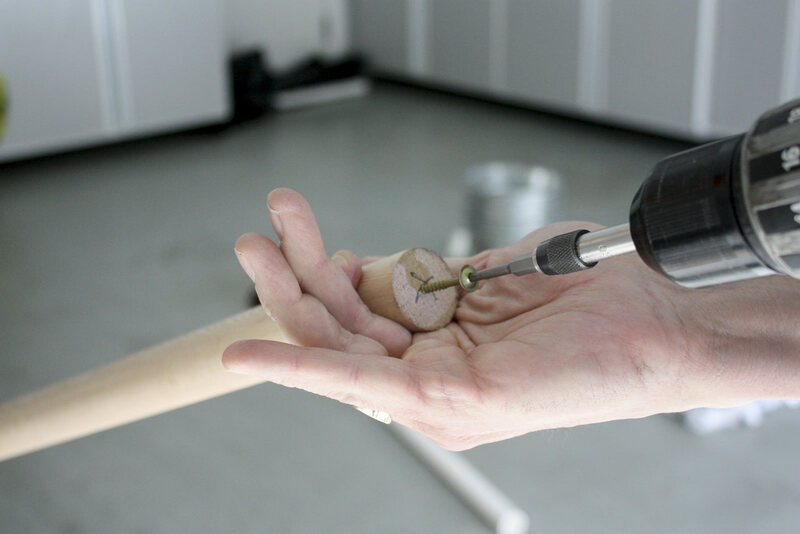 Using your hands (make sure they're gloved! 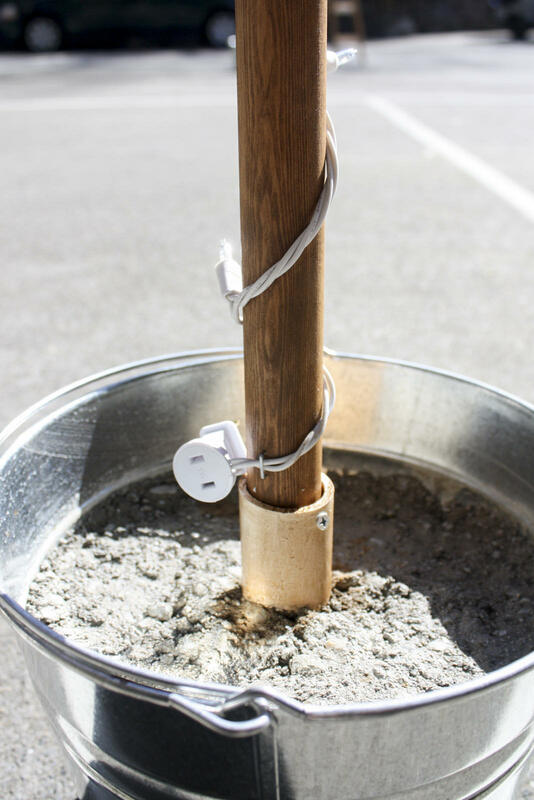 ), transfer the concrete into a pail. 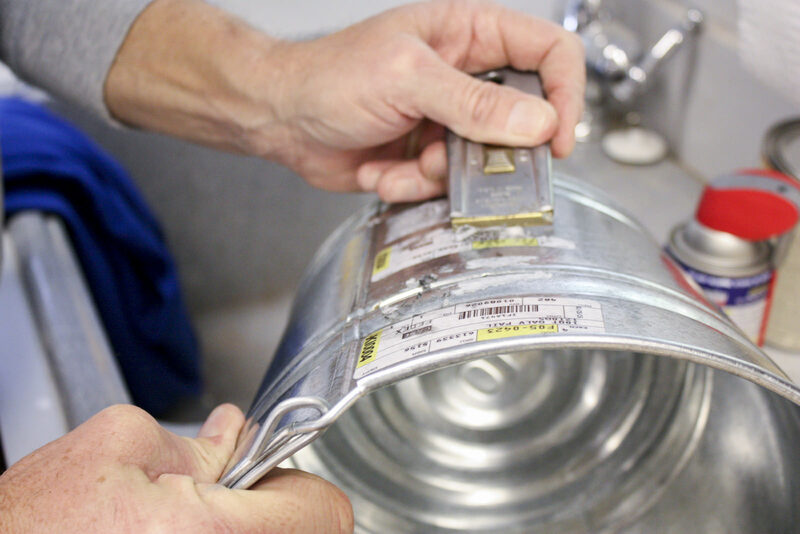 Fill each bucket to about two inches below the rim. Pack the concrete down, smooth it in place, and use a level to make sure the pipe and round are straight up and down. Do this for each of the buckets. One bag of concrete should be enough to fill two buckets. If your concrete is too dry, you can use a spray bottle of water to wet the top and smooth it out. Use a wet rag to clean off any messy concrete. This step is optional. We decided to top off each hemlock round with a finial which was a darker brown than the rounds, so we stained the rounds to match the finials. If you don’t use finials or they already match the rounds, you can skip this step. If your lights will be outside, you may want to use a stain to protect them from the elements. 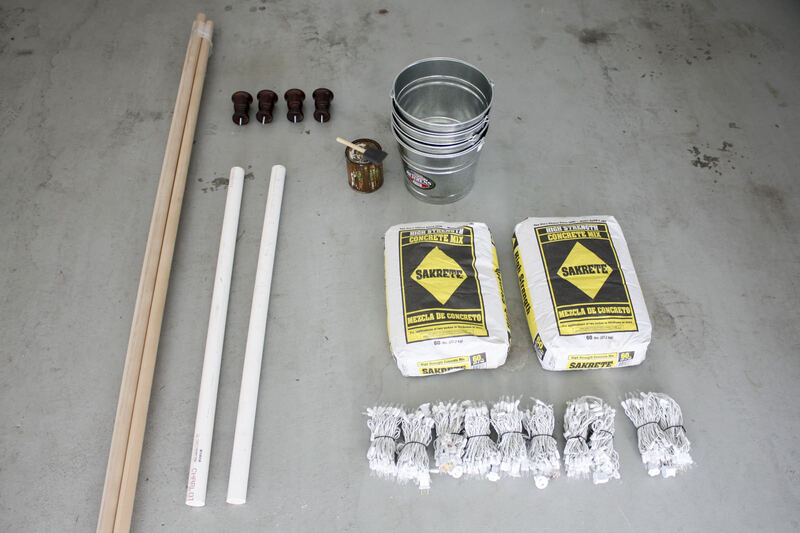 While the concrete is setting, remove the tape from the wood and stain the rounds. When your concrete has set (refer to package for drying times) take down the poles and remove the screws from the top. Predrill a hole, then take a 1" screw and secure the PVC sleeve to the pole. 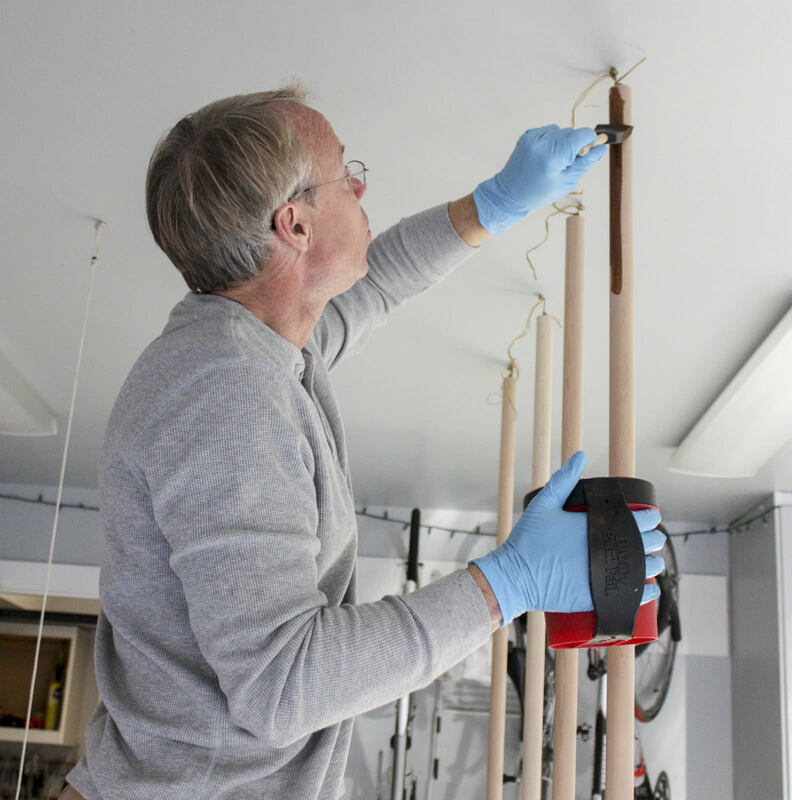 This will prevent the pole from twisting when the lights are attached, and can still be easily removed for easy storage. If you haven’t already, decide on your dimensions. 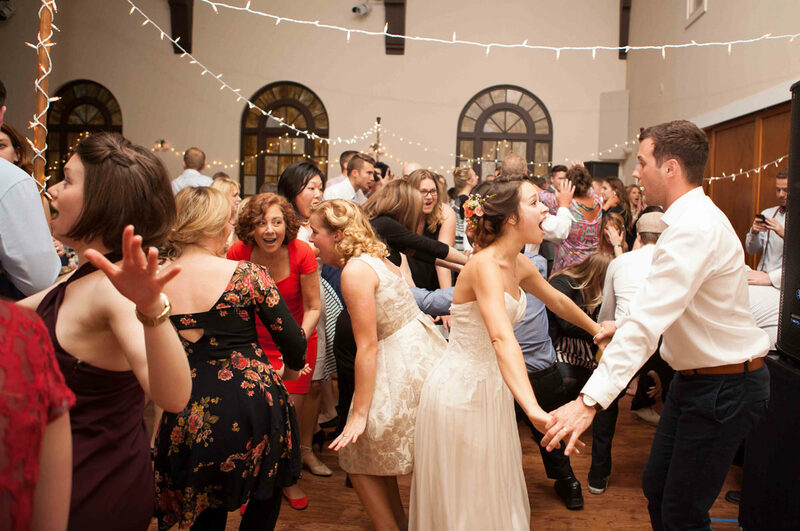 Our dance floor was 12’ by 22’, which informed the dimensions we decided on. 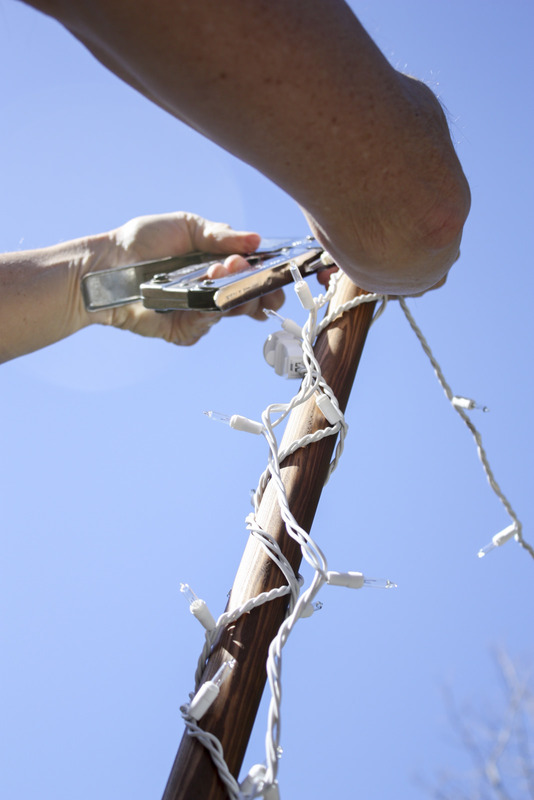 Starting at the bottom of your first pole, staple the first strand of lights to the bottom. Wrap the lights around the pole and secure at the top. Measure and place your second bucket and pole 12' from the first. Stretch the lights across with enough slack so that the lights aren't tugging to hard on the poles. Starting at the top of the second pole, staple in place. Wrap the lights down, then back up. Space the third bucket 22’ apart from the second, creating a rectangle, and stretch the lights across. Now, you're on the third pole. Start at the top, wrap down, then back up. Place the fourth bucket 12' from the third and 22' from the first. Wrap lights down and staple in place. Arrange any remaining lights inside of the first bucket. 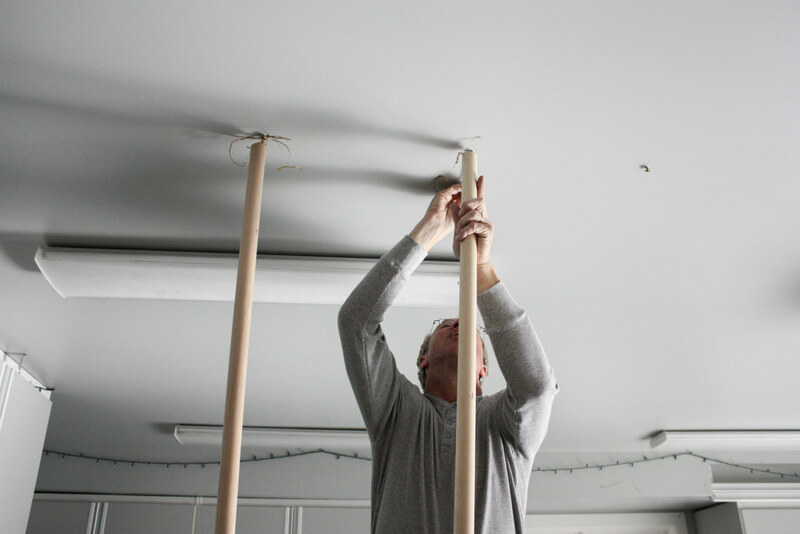 We added a finial to the top of each pole to give it an elegant finish. Screw the finial into the hole left from hanging the pole. Cover up the concrete with moss, rocks, or confetti. Seattle's salvage yards, Goodwill stores, and estate sales are filled with second-hand treasures. After a quick visit to the Ballard Goodwill, I left with full hands. When I saw this piano bench, I knew it had great potential. A little brainstorming, a little elbow grease, and you've got a piano bench makeover!